FILE - Iceland's Prime Minister Sigmundur David Gunnlaugsson speaks during a parliamentary session in Reykjavik, April 4, 2016. He resigned Wednesday under pressure from thousands of protesters after documents linked him and his wife to shady financial dealings. Iceland’s prime minister resigned Tuesday, the first casualty from the Panama Papers disclosures about the hidden offshore investments of the wealthy, powerful and famous from around the world. Prime Minister Sigmundur David Gunnlaugsson quit after the leaked files from a Panamanian law firm showed that his wife, Anna Sigurlaug Palsdottir, owns a company in the British Virgin Islands that has more than $4 million in claims against the country's collapsed banks. Gunnlaugsson said his wife's overseas assets were taxed in Iceland, but his opponents said he should have disclosed his wife's ownership of the company since the government is involved in settling claims against the bankrupt financial institutions. He quit ahead of a planned no-confidence vote in parliament, with the ruling Progressive Party naming its deputy leader, Sigurdur Ingi Johannsson, to take over as the country's new leader. 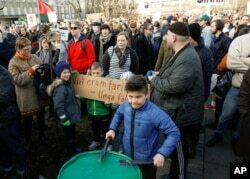 Thousands of Icelanders protested in Reykjavik outside parliament Monday, hurling eggs and bananas and demanding Gunnlaugsson's ouster. Gunnlaugsson and his wife set up the company with the help of the Mossack Fonseca, the law firm at the center of the massive leak of 11.5 million documents from its files. Earlier Tuesday, President Olafur Ragnar Grimsson, who cut short his U.S. visit, refused Prime Minister Sigmundur David Gunnlaugsson’s request to dissolve the government and parliament and call new elections. People gather to demonstrate against Iceland's prime minister Sigmundur David Gunnlaugsson, in Reykjavik on Monday April 4, 2016. The Washington-based International Consortium of Investigative Journalists on Sunday detailed the creation of offshore companies for 140 politicians and public officials, wealthy individuals and other prominent figures from across the world, raising questions about why they set up the companies and whether they have dodged taxes on their profits. In addition to Iceland's prime minister, the journalists' group said the documents showed dozens of transactions totaling nearly $2 billion involving people or companies linked to Russian President Vladimir Putin. Other high profile individuals include the prime ministers of Pakistan, the presidents of Ukraine and Argentina, and the king of Saudi Arabia. 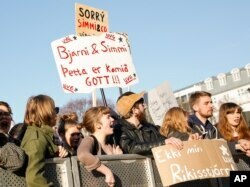 People gather to demonstrate against Iceland's prime minister, in Reykjavik on April 4, 2016. ICIJ also said that documents reveal that at least 33 people and companies blacklisted by the U.S. government because of evidence that they’d been involved in wrongdoing, such as doing business with Mexican drug lords, terrorist organizations like Hezbollah or rogue nations like North Korea and Iran, have had dealings with the Mossack Fonseca law firm. The group also claims the documents show that major banks are behind the creation of the hard-to-trace companies in so called offshore havens. More than 500 banks, their subsidiaries and branches have created more than 15,000 offshore companies for their customers through Mossack Fonseca, the group alleges. U.S. President Barack Obama said tax avoidance is a worldwide problem, often enabled by "poorly designed" laws that are easy to exploit. "A lot of it is legal, but that's exactly the problem," he said in Washington. Governments across the world said they are examining the documents to check on the tax liability of the individuals named in them, while some people whose names were disclosed have denied any wrongdoing and denounced the reports as unfounded attacks.